I love refering to myself in the third person. I have very few photos of me at work on the blog. 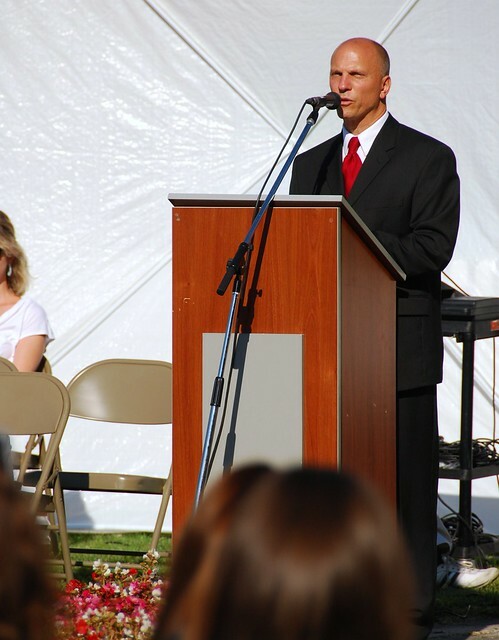 This photo was taken at the opening assembly on the first day of school in August. It was a very hot day and the sun shining directly into my eyes. Below are my notes on the opening speech. It is not exactly King’s “I Have A Dream” speech, but maybe it will be interesting to someone in the future. I would like to welcome all of you to the official start of the 2010-2011 school of the International School of Belgrade High School. In our fifth year of existence, this is the most international that we have been. This year we welcome 97 students from at least 28 different countries. I say at least, because if you dig a bit below the surface, you will find in many families, several different passports or cultural influences. To start with we have students from Poland, Australia, Serbia, USA, Montenegro, Romania, Germany, Israel, India, Sweden, Russia, Canada, Belarus, Italy, Czech Republic, Turkey, Norway, New Zealand, Austria, Slovakia, China, Hungary, France, UK, Slovenija, Croatia, and Denmark. There are probably a few I missed due to some of your complicated backgrounds. We embrace this diversity and believe it makes for a richer educational environment. Not only are all of you students, but you are also all teachers, because we learn from each other. All 97 individuals are valued here at ISB High School, and we look forward to what you can contribute to the life of the school. Two values in our ISB mission statement are “open mindedness” and “global responsibility.” With such a diverse cultural environment, it is very important that we keep these two values in our consciousness. I would like to welcome the 16 new students to the High School. A special welcome to Jessica, Emma, Marko, Sezgi, Rebeka, Mateja, Jonathon, Rachel, Rachel, Seth, Rakel, Hanna, Jordan, Chincia, and Stine. I highlighted our diversity; I would also like to acknowledge our appreciation for our host country, Serbia. All of the expatriates here today, enjoy living in Belgrade and being part of the ISB community. Much of that is due to the kindness of the Serbian people. The Serbian students and teachers are our intimate connection to the local community. Serbia has a long and rich cultural history, and all of us upon leaving Belgrade, will be ambassadors for Serbia. On behalf of the international community here today, hvala, for welcoming us to Serbia and accepting us as friends and colleagues. I would also like to direct a message to the class of 2011. Your senior year is a crazy, wonderful, exhilarating ride. You will be applying for universities, preparing for the IB exams, and entering a new stage of your lives. It can be stressful and I want to assure you that you will be fine. Not only do you have the support of all of the faculty and your parents, but you also have the support of your classmates. Some of you have been here a long time, others, it is your first day, but you will need to help and be there for one another. You also have a lot of eyes watching you with the lower grades. Remember that you are the role models here and set the tone for the school. Have a positive attitude, try your best, and as the third part of our mission statement says, strive for excellence. Keep in mind also, that time goes by quickly, so savor your time with your parents, siblings, and friends this year. Come May of next year, there will be many changes. Speaking of seniors, I would like to introduce one of them, student council officer, Anna Turner. As the Principal, it is my job to protect the learning environment here at ISB. We want everyone to feel secure and be able to concentrate on learning. There are a few points of emphasis I would like to make regarding the Parent-Student Handbooks you received in your mailboxes this morning. I want to note that I will be working with the Student Council to support student life here at the school. It is my goal to have a better school store (Party Services). We will also be placing the coffee and chocolate machine in the store for student access during breaks. We will continue to have a senior privilege of leaving campus during lunch break (after permission forms are signed).